Men Sweatpants Outfits. Hey guys get ready to be the heart throbs with our funky suggestion of sweatpants without the hassle of spending your hard earned money on expensive clothing. Sweatpants are must to have and of course, guys can’t live without them because they let you be in your comfort. Do try our 20 suggestions and let us know what you think about these. Go to university in style without opting for jeans or dress pants. Wear your grey sweatpants with, Casio watch and your navy blue rain coat, pair these with the matching converse and t-shirt and enjoy your day in your university with style. Also have a look at these 20 Trendy Outfits for College Guys. People think sweatpants can not give you a neat look and no matter what these pants are too casual to be worn in public. Well, let me tell you a good news, sweatpants are meant to keep you comfy so you can wear them whenever you want to as long as you know how to carry the look positively. Wear your sweatpants with a scarf and overcoat, straighten your hair for this look. Show off your dandy style with these straight gray sweatpants, white club collar shirt and short, cropped fringe hair cut. You can wear your beanie cap too with this look. Here are 17 Most Popular Street Style Fashion Ideas for Men. Love your sweatpants enough to wear them in your workplace? Well, yet you can if your sweatpants are not baggy. Wear them with a proper forward-point collared shirt and a slim fit dress coat. To keep the look formal wear tan bucks with this look. Wear your simple sweatpants and shirt with a leather biker jacket to make you look more fashionable and cool. Stay in your comfort by wearing sneakers and a beanie with this style. Do check out 15 Ways to Wear Different Hats Fashionably. Sweatpants can be worn any way you want but if you have a meetup or some friendly get together, don’t go like a junkie:) instead pair up your sweatpants with a striped shirt and denim jacket and wear your wing tip shoes with this look. Wear your jogger sweatpants for jogging. These woolen sweatpants will save you from chills while you can enjoy your jogging routine with ease. Here are the best Men’s Workout Outfits. Navy Blue is the color that goes with everything. So wear your navy blue sweatpants with a round neck sweater to pull off a gentleman look. Wear your sweatpants with a tank top to have a rapper look. A bandanna on your head and few bracelets in your hand will complete this look. Who does not own black sweatpants! We all do, so lets experiment few styles with it. Wear it with full sleeved tees and a gray bomber jacket and look like a model straight from Men’s Fashion Magazine. Check out these Black Pants Outfits For Men. If you love sweatpants so much that you even want to wear them to the office, then you need to work a bit hard with your dressing. Don’t be lazy, wear a neat, ironed button-down shirt with a gray coat and matching pencil sweatpants. Not only will this style give you a tidier look, you will also be comfortable with your style and it will not be hard on your budget. Baggy sweatpants are ultimate street style, if rightly worn, they look very cool and are perfect for casual occasions. Wear your Baggy sweatpants with a tank top and wear a jacket for a rock star look. Or you can wear your baggy sweatpants with a sleeveless printed top too if you are going to a beach or having a dance party at your place. For those residing in colder regions, wear your sweatpants with a plaid shirt and jacket, cover yourself in dark colored shawl and comb back your cropped hair with a gel. This look will give a mysterious air to you, perfect if you like people to praise you for your style. Don’t forget your high ankle boots with this look. Here are 18 Latest Men Casual Outfit with Blazer. Sweatpants are not only for workouts or casual clothing. 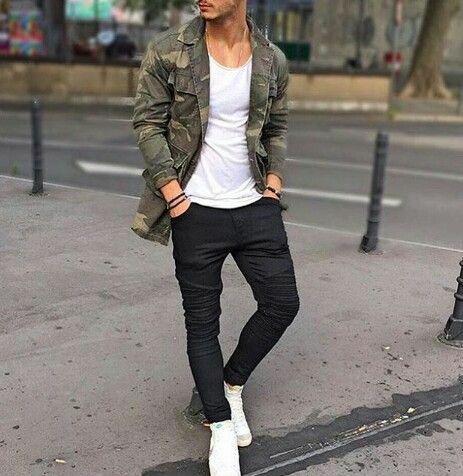 If you find a skinny sweatpants, wear it with your simple shirt and cargo printed jacket. You’re all set for the date. Because sweatpants are informal kind of clothing, when pairing them with a polo shirts or t-shirts, it is preferred that you wear either your converse, sneakers or vans. If you are replicating the below shown look make sure your hair are either short sided one or you have a textured hair cut. RECOMMENDED: 30 Best Men’s Outfit Ideas to Wear with Monk Strap Shoes. Staying indoors doesn’t mean that you can’t look neat and stylish. Your favorite T-shirt and your sweatpants with a neat slicked-back haircut can do the magic. Ombre Sweatpants are all the rage these days, you can wear them with colored tank tops or t-shirts of your choice and you’ll look very dandy in it. Just by the way, if you have a baggy jeans sweatpants, bleach half of it to get the ombre sweatpants at home. Don’t miss out 20 Shoes To Wear With Guys Sweatpants. Well, yes sweatpants are for a workout so why not wear them on your workout routines:) but in style. Warm gray sweatpants with a gray sweatshirt and your lovely ruffled hairstyle. If you love prepster style then go for a simple hand knitted gray, round neck sweater with the black sweatpants. Not only is this look very smart, but it makes you look sophisticated and very neat. The best thing about sweatpants is the kind of flexibility it gives if you’re a sportsman. This chic style is for those who enjoy sports on daily basis or regularly. Don’t forget your canvas shoes with this look.